Posted on Tue, Nov 29, 2011 : 4 p.m.
Ypsilanti police are searching for a man accused of breaking into two businesses recently as detectives continue to investigate a string of burglaries in the downtown area. Daniel Thomas Bewernitz, 30, of Ypsilanti, is charged with two counts of breaking and entering of a business, Det. Sgt. Troy Fulton said Tuesday afternoon. Police said Bewernitz broke into Dos Hermanos Market at 412 W. Michigan Ave. on Sunday and One Twenty Three Skate Shop at 123 N. Washington St. last Monday. Fulton said he doesn't have details on what was taken. Investigators said Bewernitz forced his way inside both businesses. The charges come as detectives continue to investigate a total of five burglaries and two attempted burglaries in the downtown area. The incidents occurred between Nov. 21 and Sunday on North Washington Street, South Washington Street, West Michigan Avenue and Pearl Street, police said. Cash and other items were taken. 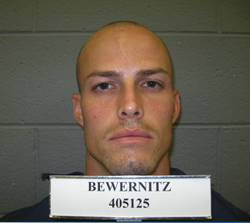 State Department of Corrections records show Bewernitz was paroled Oct. 5, 2010, after being convicted in Wayne County of breaking and entering a building with intent and second-degree home invasion. He also has a conviction for malicious destruction of fire and police property. Police have released a "wanted" poster for Bewernitz. He is described as white, 6 feet tall and 165 to 170 pounds, with brown hair. He has a buzz cut. Police said he might be armed. Anyone with information can call Ypsilanti police at (734) 483-9510 or Detective Annette Coppock at (734) 368-8776. Wed, Nov 30, 2011 : 1:26 p.m. Remember that story about one of the FBI's most wanted being sought after, but AnnArbor.com's policy was to refuse to name the suspect? That was funny. Looks like that isn't the case anymore. Wed, Nov 30, 2011 : 2:10 a.m.
why the pdf of the wanted poster? are we supposed to print them and distribute them? it's the same person as the mug shot in the story... help me understand this bro. Wed, Nov 30, 2011 : 3:09 a.m. It's the same person, of course! The picture is a little different, though. Tue, Nov 29, 2011 : 11:07 p.m.
is this the same idiot who's broken into Beezy's of late? For the love of GOD, people. Things are hard enough for small business owners. If you feel that you must take things that are not yours, stick to chains, please. Tue, Nov 29, 2011 : 10:35 p.m.
OH my, his history and now this is scarey! No address listed, but then I don't think I really want to know. This is Police work! And they are doing a great job, we can always help by staying on the look-out for this suspect.